Last night at the Garden, a golden opportunity presented itself to the Rangers. The Montreal Canadiens came into MSG, having arrived in the wee hours after their shootout victory over Tampa Bay in Montreal. Coming into the game, the Rangers were in 7th place and had a chance to solidify their place and perhaps, with a regulation victory, draw closer to Montreal in 6th place. Montreal was also missing 4 players due to injuries. 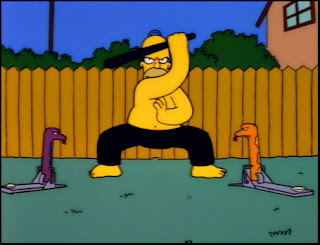 The Rangers, meanwhile, were rested from their Tuesday night game against the Isles, watching other teams in the conference playoff race taking turns knocking each other off. 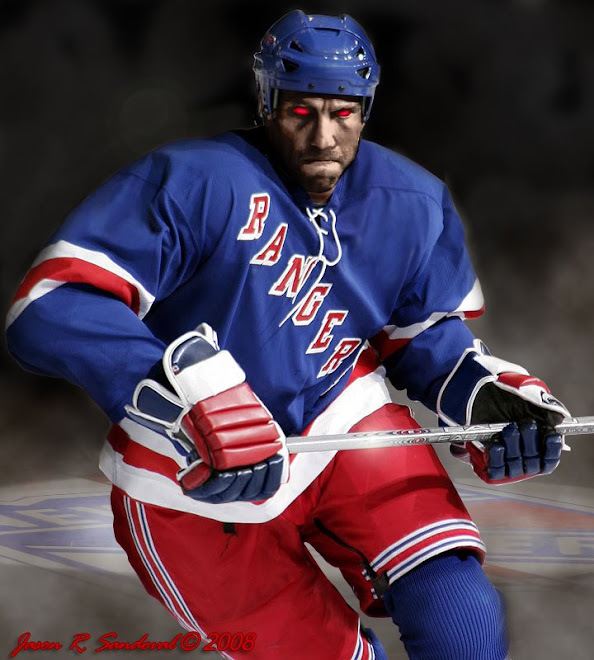 The simplest approach for the Rangers would have been to exploit these advantages like they did against Philly a couple of Sundays ago, as opposed to the klunker against Minnesota. The game would be an indication whether the maturation of the team now included taking advantage of a depleted opponent, continue a consistent offensive presence, and perhaps string some wins at home. Much to the fans' surprise, the team proved that it could capitalize. The Rangers hit the ice fast and furiously, starting with a fight at the opening whistle between Brandon Prust and Travis Moen. They also brought again their new uptempo offense, ferocious forechecking and cycling as they outscored the Habs 5-1 in the opening period as they won their 3rd straight home game with a 6-3 victory over the Montreal Canadiens in front of a loud MSG crowd. Official recap is here. Steve Eminger eyes Lars Eller along the boards. During their last 3 home games -- all high-scoring wins, 7-0 over Flyers, 6-3 over the Isles and 6-3 over Montreal -- the Rangers have scored at least 2 goals in the opening period of each game. They have forechecked relentlessly and dominated great swaths of game time in the offensive zones, even on the road s evidenced by their strong effort in San Jose. It is evident that the loss in Anaheim was just a bad game and not symptomatic of the team falling into a late-season swoon. They have launched numerous shots on goal, the power play has shown more energy and actual success (they even surprised fans by scoring on a 5-on-3 PP against the Isles). 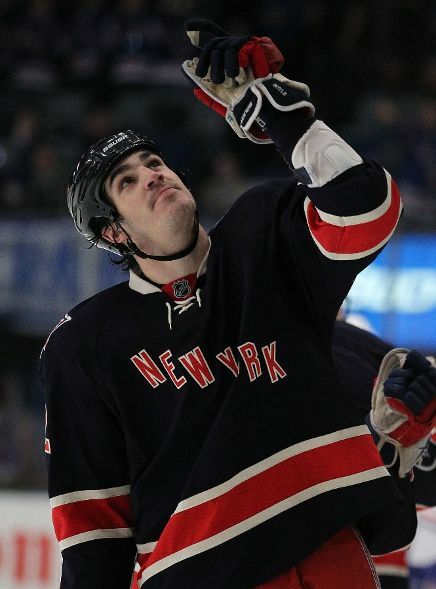 Their playmaking has improved; players are not afraid to shoot from anywhere on the ice as witnessed by Dan Girardi's goal (his first in 3 months) by blasting a rebound from outside the left circle, and the 3-on-1 rush orchestrated late in the first period by Marc Staal that led to a cross-ice pass to Brian Boyle on the right who rifled a shot past weary Carey Price. Another Early Start. Keeping with a recent theme of play of scoring in the first period, Artem Anisimov starts the 5 goal first period by converting a breakaway at the 5:28 mark. Missed it by that much. 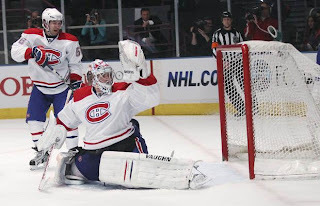 After PK Subban tied the game nearly 2 minutes later, Carey Price proved you cannot stop what you cannot see as Dan Girardi's opportunistic blast from the left circle blows past him into the back of the net for a 2-1 lead at the 10:11 mark. Glove Hand Needs Work. Ryan Callahan extended the Rangers lead to 3-1 at 17:09. Then 32 second later, Marian Gaborik's shot whizzes past Price's glove hand for a 4-1 lead at the 17:41 mark. 3-on-1 breakout converted -- 35 seconds later, Brian Boyle converted a cross-ice pass from Marc Staal in a terrific 3-on-1 rush. 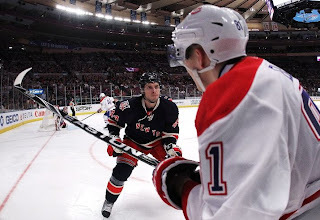 Over a period of 1:07, the Rangers scored three times to extend a 2-1 lead to 5-1. 3 straight home wins; 3 straight goalie knockouts. During their current streak of 3 straight wins at home, the Rangers have outscored opponents 19-6 and knocked out 3 straight starting goalies. The latest victim, alleged Vezina candidate, Carey Price, got to sample the same view of the inside of the net that the 5 Ranger goals enjoyed in the first period. One worrisome point -- because they need every point they can get and no longer have Marty Biron to rely on, Henrik Lundqvist has been playing every game for a month. He deserves our admiration as he won his 30th decision of this season. In his 6 years as Ranger goalie, he was won 30 or more games each year from the start of a career -- the first goalie in NHL history to do so. Fortunately, there have been some gaps in the schedule between games. Also, the Rangers' scoring has taken some pressure off Henrik during crunch times of recent games where outcomes have not been in doubt in the 3rd period (except for the San Jose game). 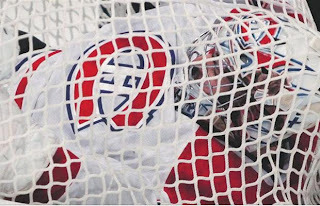 However, he still has been called upon to make incredible saves early in games to keep the Rangers in the game. Henrik's performance during the Sharks and Isle games were filled with highlight reel saves. 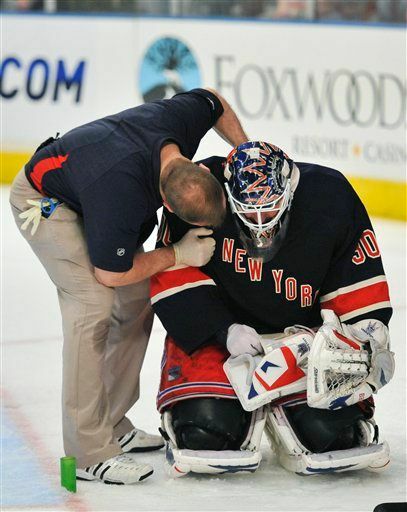 Also, last night Henrik took a beating from the Canadiens and seemed to suffer a neck injury with 3 minutes to go when he was hit by Benoit Pouliot. Whether the injury impacts his ability to play in Pittsburgh on Sunday afternoon remains to be seen. In the post-game Henrik admitted that his neck felt sore. 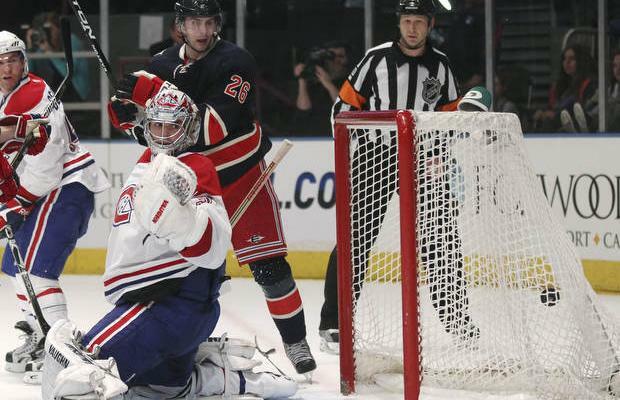 The Rangers may have to start Chad Johnson to play it safe -- it helps that the Blueshirts have won 3 in a row. The Rangers have hit this stretch of 4 home games among the next 5 by beating 2 rivals (the Isles and Montreal). Tomorrow, they travel to Pittsburgh for a mid-day contest before the next 2 home games against lesser conference teams. Getting 4 points or more from these 3 would enable the Rangers to maintain or even increase their position. Meanwhile, at the Rock, the Devils' storybook run from the outhouse to the subbasement of the Eastern Conference took a real hit last night. Although outshooting the Washington Capitals, 33-12, Marty Brodeur let 3 behind him as the Devils were shutout 3-0. The Devils have lost 2 in a row. Their inability to score (Kolvachuk has 25 goals) has come back to hurt them recently. The Devils have been outscored 5-1 in the past 2 games and Brodeur has not looked like a difference maker out there. With 10 games to go, the Devils have to leap over 3 teams to get to 8th and trail Buffalo and Carolina by 6 points. Right now, the Rangers are in control of their destiny and this season, which has taken on its own identity and magic, continues to be entertaining and promising.